Since 1897 many world travelers have enjoyed the pleasures of the privately owned and managed Park #Hotel Kenmare. Set in a heavenly location overlooking Kenmare Bay the hotel is in the heart of Ireland’s most scenic countryside. Spacious guest’s accommodations are individually furnished with unique and personally selected antiques. The restaurant has attracted the most prestigious international awards and is consistently rated among the finest in Ireland. The Hotel is also home to the Deluxe Destination Spa, SÁMAS. Adjoining the hotel on a wooded knoll SÁMAS is a true world-class Spa. There are separate Male and Female Spas to meet an individual’s distinctive needs. This is complemented by a team of SÁMAS professionals who are trained to design treatments tailored for you. As the translation from Gaelic implies SÁMAS is a pure indulgence of the senses. Unlike other spas where you have to choose what treatment you want when you book, at SÁMAS you do not have to decide what actual treatment you want until you arrive at the spa. This unique approach ensures a treatment to your mindset at that time. A menu of treatments specifically designed for SÁMAS is another unique feature of the facility. In addition, the 25mt Lap Pool is simply divine. An energy engaging facility to complement the passive nature of SÁMAS, its inviting nature is irresistible. Constructed of stainless steel and located underground the ambiance is serene. Daily swimming classes and water aerobics are just some of the features guests can avail of. An abundance of outdoor activities also awaits you. 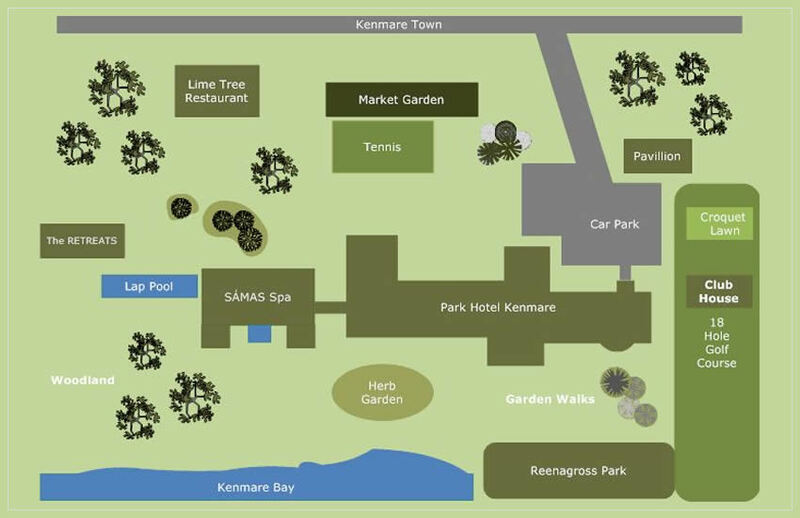 The Hotels grounds offer tennis, croquet and garden walk along the water shore. The adjacent 18 hole Kenmare Golf Club provides a challenging parkland course. The area has many Championship Links Golf Courses within a short drive. Horse riding, sea and game angling, mountain walks and the famous coastal drives are some of the activities offered.